“Europeans wanted to bring the Jews here to preserve their interests in the region. They asked Holland, which had the world’s largest fleet, to move the Jews,” he said. Abbas’s Ph.D. thesis, which he wrote for a Soviet university controlled by the KGB in the 1960s denied the Holocaust. Over the past 25 years, the Western and Israeli leaders that have hailed Abbas as a moderate dismissed the significance of his doctorate – which he later published in Jordan as a best-selling book – saying it was a relic of the PLO’s former rejection of Israel’s right to exist. The problem with Rivlin’s statement is that it ignores Abbas’s record. Contrary to Rivlin’s view of Abbas’s racist assault on Jews as a throwback to an earlier time, antisemitic diatribes have been a consistent feature of Abbas’s public statements, whether he is speaking to Arab or Western audiences. As for his Holocaust denial being a thing of the past, Abbas posted his doctoral thesis on his official website. His lies are taught as fact in Holocaust education in the Palestinian school system – which he controls. In 2013, 150 protesters demonstrated against then-president Barack Obama when he met with Abbas. In 2007, protesters who worked for Abbas’s government greeted then-Secretary of State Condoleezza Rice with signs calling for Hezbollah to bomb America. So in stark contrast to Rivlin’s statement, Abbas’s speech was not a throwback to a long ago time. It was a throwback to what he said yesterday, and the day before yesterday and the day before that, and what the Palestinian newspapers and television – which he controls — reported the day and week and month and year before that. Another explanation of Abbas’s scorched-earth speech Sunday is that he scorched the earth in preparation for his resignation from office. Abbas, Israel’s commentators were quick to note, is 82 years old. So it seems reasonable to conclude that his decision to launch a frontal assault against Jews and Americans was a sort of valedictory address. 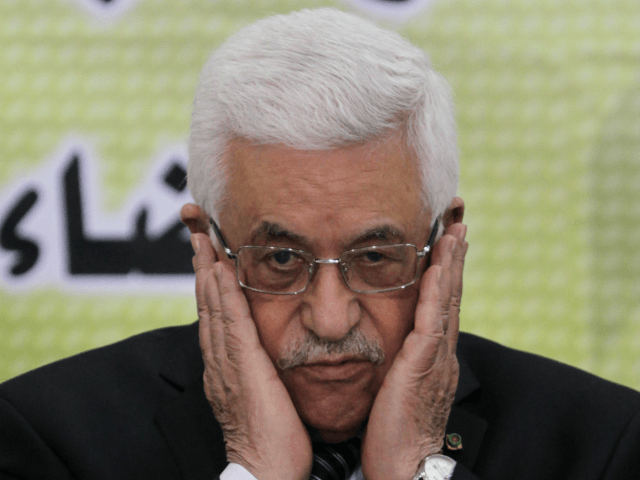 But here too, the assessment is contradicted by Abbas’s record. The Hamas terror group ousted Abbas and his U.S.-trained PLO forces from Gaza in 2007. Rather than launch a U.S.-backed counterstrike against Hamas, Abbas chose to collaborate with Hamas. He has funded Hamas’s government. That funding has enabled the jihadist group to launch a series of missile wars against Israel. Moreover, Abbas has used the PLO’s position at the UN and in Europe to protect Hamas from criticism and wage a political war against Israel. The goal of this war is to end Western support for Israel’s right to exist by delegitimizing Israel as a colonialist implant of European imperialists. So if Abbas isn’t planning to retire, why is he cursing Trump and his senior advisors? Why is he recycling anti-Jewish blood libels from the 12th century and announcing that the deals he signed with Israel and the peace process as a whole are dead? The simple answer is that Abbas is acting as he is because he is certain that he can. This is how he has always acted. There is nothing new in his speech. And he doesn’t think that he will suffer any consequences for behavior. Abbas expects President Trump to disregard his statements and continue to bankroll his terror-supporting regime in the name of “the peace process,” or “humanitarian assistance” just as Bush and Obama did. Abbas gave his speech at start of a two-day conference of the PLO’s Central Committee, which he convened to determine a response to President Trump’s announcement on December 6 that for the first time in nearly seventy years, the U.S. recognizes that Jerusalem is Israel’s capital. Trump’s Jerusalem declaration placed Abbas and his colleagues in a conundrum. On the one hand, his declaration had no practical implications. Trump signed a waiver delaying the transfer of the U.S. embassy in Israel to Jerusalem. No immediate plans have made to move the embassy. Moreover, the State Department insists that there is no practical significance to Trump’s statement. Acting Assistant Secretary of State for Near Eastern Affairs David Satterfield told reporters the day after Trump’s announcement that his statement does not change U.S. policy barring American citizens born in Jerusalem from listing Israel as their country of birth on their official documents. Indeed, Satterfield refused to answer a question regarding whether Jerusalem is even in Israel. On the other hand, simply by recognizing the basic fact that Jerusalem is Israel’s capital and has been Israel’s capital for nearly 70 years, Trump broke with the longstanding U.S. policy of denying observable reality in relation to Israel in order to advance “peace” between Israel and its Arab neighbors. Only by denying reality can anyone pin hopes on the PLO as a peace partner. Since its inception in 1964, the PLO has rejected Israel’s right to exist. It has rejected that the Jews are a people. It has denied the history of continuous Jewish habitation of the land of Israel for 3,500 years. And it has denied the fact that the Jews built two temples in Jerusalem. When Abbas said on Sunday that Israel is the creation of European imperialists, he was merely echoing the PLO’s charter. By recognizing the truth, Trump took a red-hot poker to the PLO’s false, antisemitic founding narrative. The President threatened to cut off U.S. aid to Abbas’s regime. Tuesday, the Trump administration informed UNRWA that it is withholding “for further consideration” $65 million of its $370 million annual contribution to UNRWA’s budget. Statements by Trump’s senior negotiator Jason Greenblatt and Friedman condemning Palestinian Authority finance of terrorism and incitement to murder Israelis have also been groundbreaking. So far, Tuesday’s hold on a fraction of U.S. funding to UNRWA is the only substantive policy step the Trump administration has taken. Its other moves have been declaratory. They have signaled the beginnings of a new U.S. policy towards Abbas, the PLO and the Palestinian Authority, but the new policy has not yet been articulated, let alone felt on the ground. Abbas is betting that Trump is bluffing so the White House’s next moves will be determinative. The partial funding postponement to UNRWA is notable, but not significant enough to make clear that the U.S. is serious in its policy shift. If no further practical, indisputable steps are taken to translate Trump’s stated positions into a clear move away from the past 25 years of unconditional American support for the Palestinians, Abbas will be empowered to continue to treat him and his administration with the same contempt he exhibited towards Obama and Bush.